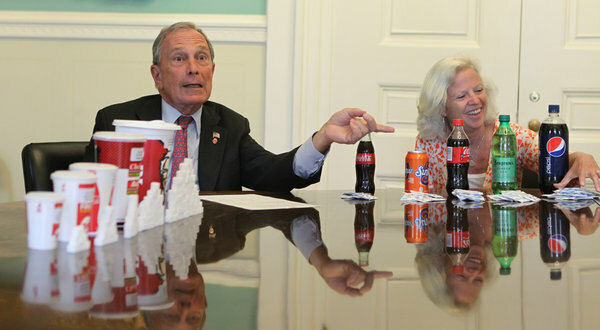 New York City Mayor Bloomberg is asking the city to enact the first ban-in-the-country on super sized sodas. The sale of any sodas larger than 16 ounces-the size of a medium coffee-would be prohibited in restaurants, fast food chains, movie theaters, sidewalk carts and sports arenas. The ban would not apply to diet sodas. He's hoping to get the ban enacted by March 2013. Bloomberg's proposal requires the approval of the Board of Health-members who are all appointed by him. “Obesity is a nationwide problem, and all over the United States, public health officials are wringing their hands saying, ‘Oh, this is terrible,’ ” Mr. Bloomberg said in an interview on Wednesday in City Hall. “New York City is not about wringing your hands; it’s about doing something,” he said. In New York City, more than half the adults are overweight or obese.